Marketers in the Asia Pacific region are upbeat and optimistic about the future of digital marketing, but many confess they still struggle or aren’t confident enough to push forward with digital marketing initiatives especially with budget and talent constraints. 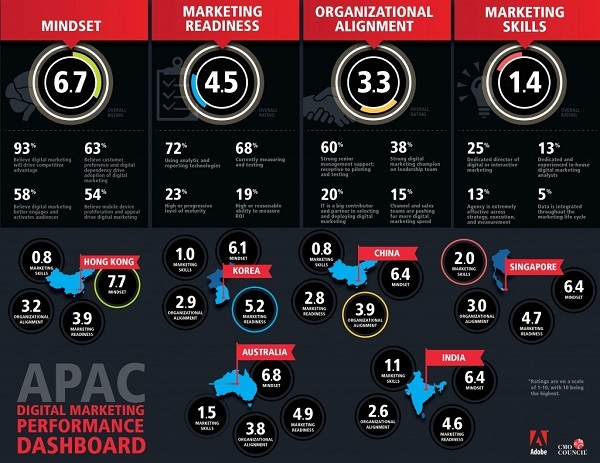 According to a new study released today called APAC Digital Marketing Performance Dashboard by the CMO Council in partnership with Adobe Systems – which surveyed 295 senior marketers from a range of industries across Australia, China, Korea, Singapore, Hong Kong and India – while 90% of APAC marketers believed that digital marketing adds competitive value for their companies, only 45 of them claim to have highly evolved digital marketing operations that lead their categories. In fact, some 44% of APAC marketers say they’re still exploring and evaluating options, with 10% saying that they’re laggards and are struggling. Two of the biggest challenges they face? Talent and budget. 53% of respondents cite budget limitations as a significant factor preventing them from undertaking critical activities such as testing and analysis. Across APAC, 72% of respondents are spending less than 25% of their total marketing budget on digital marketing initiatives; and of that group, 37% are spending less than 10%. This budget definition includes website development and content, email marketing, search engine optimization, online advertising, social media community management and advertising, amongst others. Budget constraint is also a key factor in not being able to get the right skilled talent. Although 38% of respondents said they had at least one strong digital marketing champion on the APAC leadership team of their organizations, nearly 49% of respondents said their current marketing teams didn’t have the right skills, experience or talent needed to take on digital marketing strategy, and 38% said they had insufficient budget to bring on the right level of senior talent. The right candidates were also not easily found, with 27% saying that they were unable to find the right staff with the right skills. Outsourcing is not the solution, with 32% of respondents saying their agencies’ capabilities were limiting their ability to execute effectively (in fact, only 13% say their agencies are exceptional). Of the countries surveyed, Singapore expects the most dramatic increase in digital investment of all APAC countries. Close to 30% of Singapore marketers surveyed plan to increase digital marketing spend to between 25 – 49% while 14% want to dedicate more than two-thirds of their marketing budget to digital marketing in the fiscal year ahead. Marketers in Singapore have the most confidence in their skillsets – 11% expressed strong belief in their capabilities compared with the APAC average of 6%. 30% of Singapore marketers surveyed cited an experienced, dedicated in-house team to tackle analytics versus the APAC average of 13%. Budgets, on the other hand, were a stumbling block for Singapore marketers with 58% saying they had insufficient budget to recruit the right level of senior talent to run digital marketing programs. 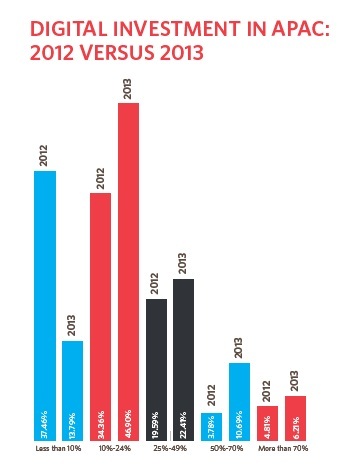 “Interest and optimism in digital marketing is high, but investment levels across Asia Pacific are still low. The majority of APAC marketers spend less than 25% of their total budget on digital. However, the number of APAC’s marketers who expect to allocate over half their budget to digital marketing is set to double in the fiscal year ahead. The commitment to digital is clearly happening,” Phibbs adds.